I love this blogpost on hopscotch. My daughter and I have been doing a lot of hopscotch lately because she really struggles with standing on one leg for any length of time. 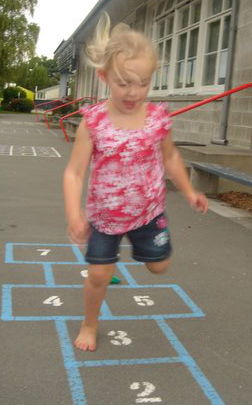 Hopscotch was one of my favorite games as a child and it still is today. In fact, Hopscotch proves one of my pet theories that (in most cases) what’s fun for kids is good for kids. Here’s my Child-At-Play/Play-At-Work analysis of this timeless, universal classic or 11 Great Reasons to Rush Out and Buy Some Chalk Today! CHILD’S PLAY. For kids, it feels good to move, and when it feels good, they want to do it over and over again… just as the rules of Hopscotch require. PLAY’S WORK. Believe it or not, hopping on one foot is one of the most complex movements the human body can perform. The technical term for it is homolateral movement, defined as one side of the body moving while the other side of the body is still. For children, hopping signals sophisticated advances in both physical coordination, balance, AND cognitive development. You see, as your child refines her physical coordination, she is also building essential neural pathways in the brain. It’s those exact same pathways which will one day become the conduits for left/right brain thinking tasks such as creativity, reasoning, and self-regulation. CHILD’S PLAY. Whoaaaa! Don’t hop on the line! As much as we think kids don’t like rules, rules provide the challenge that make games like Hopscotch so much fun! PLAY’S WORK. As much fun as hopping is, it’s pretty easy once you get the hang of it unless something gets in your way. And that’s where the mechanics of Hopscotch are so brilliant, forcing kids to hop, jump and stop with deliberate control. As such, Hopscotch is a master at helping children master self control. CHILD’S PLAY. The thing about hop-hop-hopping is that in order to get good at it, you’ve got to get into a regular rhythm. Hopscotch gives kids lots of hopping practice, of course, which helps them find their rhythm. But more, the rules of the game require you to stop hopping, do something else, then start again. And that’s the best practice of all for developing rhythm. CHILD’S PLAY. Once children have tackled hopping, leaping comes next, which is also a big part of Hopscotch. As the game progresses, it’s often necessary for children to leap over two or more spaces at one time. Two-footed, that’s hard. But Hopscotch requires a one-footed leap, and that takes a lot of strength. PLAY’S WORK. Strength builds physical stamina, of course, but it more, when young children push themselves to new, physical achievements, the brain is recording these sensations and preparing itself to take on even bigger challenges in other areas of life and learning. For instance, when confronted with a gnarly math problem, children who understand the effort it takes to leap stand a better chance of sticking with the problem. CHILD’S PLAY. A typical turn in Hopscotch looks something like this: Throw… stand… hop… stop… bend… pick up… straighten up… leap… jump… hop… hop.. land… turn… and repeat. Now do most of that on one foot and that’s a real test of balance! PLAY’S WORK. Balance is an essential building block to all physical movement, and cognitive, emotional, and social growth as well. Hopscotch is ingeniously designed to challenge children’s sense of balance and orientation. CHILD’S PLAY. The iconic spaces of a Hopscotch board determine the playscape, define the rules, and present the challenge. PLAY’S WORK. So often today, we encourage children to “think outside the box” or “color outside the lines.” These metaphors for creative thinking and problem solving are great, and I’m all for them. But there are times when boxes and boundaries are necessary to help children develop fundamental skills. And Hopscotch is one of those times. You see, by fitting themselves into the boxes on the game board they are developing spatial awareness which helps them understand how they “fit” in the world and even more, how the world “fits” together… just like the spaces on a Hopscotch board. CHILD’S PLAY. The game begins by pitching your pebble onto the game board. Until you get the pitch right, you can’t play, making Hopscotch a natural motivator for eye/hand coordination. PLAY’S WORK. This humble beginning is actually a test of a child’s ability to see a target with her eyes and translate that knowledge to her arm and hand to determine the right aim and amount of force necessary to reach the target. That’s eye/hand coordination at work, and while we don’t see it, there’s a ton of body-brain computing going on. And of course, with each turn, the target changes, getting further and further away, challenging her ability to make tiny – but important – adjustments for accuracy. CHILD’S PLAY. Achievement is part of every turn, signified by retrieving your playing piece from the game board. But Hopscotch doesn’t make it easy for little ones, which is all part of the fun! PLAY’S WORK. Stopping mid-way through the game board on one foot is hard enough. Now the rules requires the player to bend over and pick up their pebble. Yikes! That takes a lot of body control and concentration. But Hopscotch adds one more wrinkle — the delicate control of the finger muscles to reach and retrieve the pebble. CHILD’S PLAY. Because the game board changes on each turn, children have to work out how they are going to approach it each time… hop-hop-leap-jump-hop-stop, etc. What fun! PLAY’S WORK. Planning and strategizing are life-long skills learned through play. But unlike sedentary board games, an up and at ’em game of Hopscotch allows children to physically realize their plan while developing on-your-toes adaptabilty. CHILD’S PLAY. Hopscotch is a great “social campfire” for children. The simple, repetitive rules make it easy for children to learn and play and stay engaged in the game when it’s not their turn. PLAY’S WORK. Friendships begin on the playground because kid-sized social experiences like Hopscotch create the framework for learning about peer relationships. CHILD’S PLAY. When light-hearted competition is introduced into play time, kids naturally push themselves to be better. No one needs to stand on the sidelines encouraging them. The natural, human drive to succeed is all the incentive they need to try harder. PLAY’S WORK. When children develop good sportsmanship, they are developing the skills and attitudes they’ll need for a well-balanced approach to life. Because in the end, winning feels great but losing build character.